So you’ve been using Spotify for a while, and you’ve got a sidebar full of playlists, with songs and albums you’ve been saving. That’s quite a digital collection you’ve got there. But now Apple Music has come on the scene, and you want to switch. Spotify won’t help you—you can’t export your playlists, at least not in any usable format—and iTunes has no way of importing your music. What do you do? Go through each and every song on Spotify and search for it on Apple Music? Nah, that’d take too long; you want to listen to music, not fuss around. Fortunately, the $5 Move to Apple Music can help you out. Working with both Spotify and Rdio, this app makes a pipeline between your accounts, finding what you’ve stored on the former services, and adding them to your Apple Music library. Choose which playlists to import into your Apple Music library. Bear in mind that at 30 seconds a song, it can take a long time to import your music. And Move to Apple Music, while practical, doesn’t match everything. Some songs are tagged differently on the two services, and some songs simply aren’t available on Apple Music. 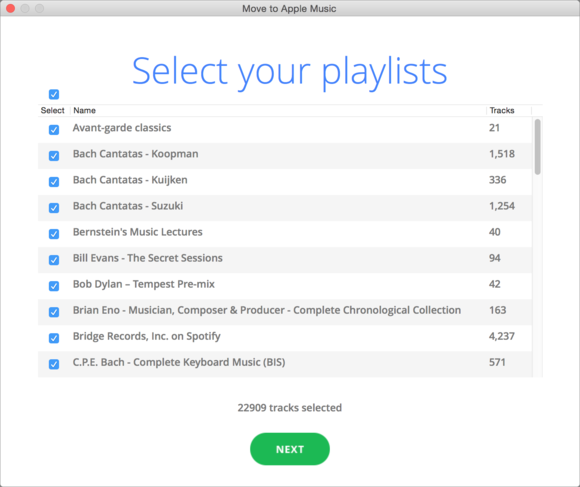 I imported music from my Spotify account, and, in my tests, the results varied widely from about 80 percent matches for rock or jazz to less than 50 percent for classical music. 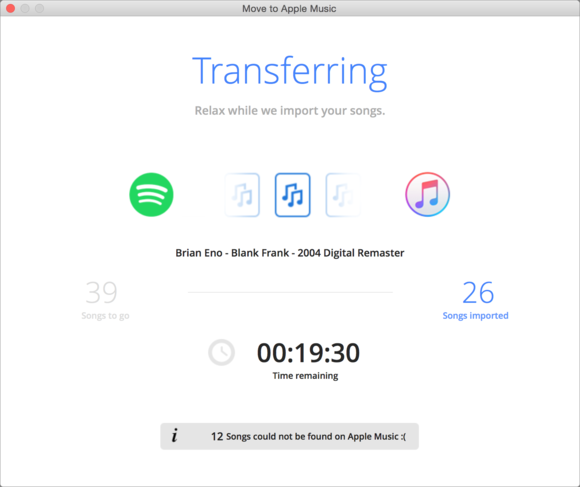 Move to Apple Music importing songs. 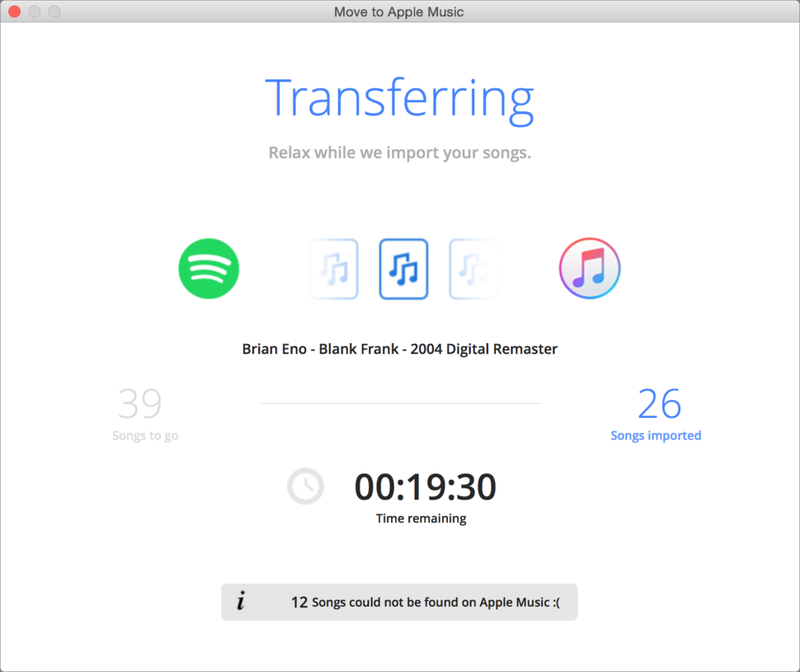 When Move to Apple Music has finished, you can download text files of your playlists, which you can then import into iTunes (File > Library > Import Playlist), so iTunes can regroup your songs in the same structure as on Spotify or Rdio. You can also download a list of songs that weren’t found, so you can, if you wish, try and manually find them on Apple Music. The app is not without issues. The first couple of versions of Move to Apple Music were a bit buggy, but the developers have worked very hard to fix these issues, and have released a number of updates in the first few days of the app’s existence. The time it takes to import everything may throw you off; when I first ran the app, it told me it was going to take 188 hours (I have some 22,000 tracks in Spotify playlists). I then decided to only import a few playlists at a time, rather than wait for everything to get copied. I’d like the matching to be better, but I understand that, especially for classical music, this isn’t easy. I have lots of long playlists of classical music on Spotify, many of which were compiled by ulyssestone, on his Spotify Classical Playlists website. I understand the limitations of Move to Apple Music, and I only wish it could be more efficient. If you’ve got a music collection on Spotify or Rdio, it’s a no-brainer to spend $5 and have much or most of it imported into Apple Music; it’ll save you a lot of time. You just need to be patient. It can't match everything in your Spotify or Rdio playlists, but it can cover a vast majority of songs and save you a lot of work, especially if you have a lot of playlists you want to bring into Apple Music.